How to convert PXL to TIF and set page orientation? If you have VeryPDF PCL Converter, luckily, you can use it to quickly and accurately convert PXL to TIF and set page orientation. If you like, you can also set color depth and resolution when generate TIF from PXL. If you haven’t installed VeryPDF PCL Converter on your computer yet, you can free download it from the web page of VeryPDF PCL Converter. After installing it on your computer, please follow the method as follows to convert PXL to TIF and set page orientation. First, please run VeryPDF PCL Converter. Please move the cursor to the icon of VeryPDF PCL Converter on your desktop, then, right click on the icon and click Open in the open-up list. The following illustrates the interface of the registered version. Second, please input the PXL files you plan to convert. There are three ways that can be used to input PXL files. Here introduces the simplest one: find the PXL files and drag them from Windows Explorer and drop them into the list box. When you see all the added PXL files on the main interface, please proceed to the next step. Click on the Output format combo box, and select the item .tif from the drop down list. To set page orientation, you can click either of the radio buttons in the Page Orientation group box. If you want to set color depth and resolution, please click Save PDF Mode on the tab bar and select options on the Save PDF Mode tab control. After setting all the options, please click OK at the bottom of the dialog box. Then you can proceed to the next step. Fourthly, please click Start on the main interface, choose a folder in the pop-up dialog box and click OK. You can go to check the result TIF files in a few seconds. 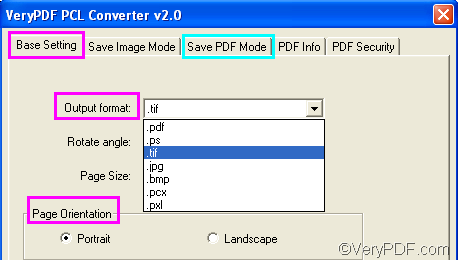 This is how you can use VeryPDF PCL Converter to convert PXL to TIF and set page orientation. I hope you can successfully solve your problem quickly. How to convert PRN to bitmap and set page orientation? How to convert PRN to PostScript and set page orientation? How to convert PRN to PXL and set page orientation? How to convert PRN to BMP and set page orientation? How to convert PRN to JPG and set page orientation? How to convert PRN to TIF and set page orientation? Is PDF Parser SDK render the wrong PDF page number? How to convert pcl to pdf and set the pdf property? How to convert EMF to TGA? Convert prn to ps and rotate page via command line? This entry was posted in VeryPDF Blog and tagged pxl to tif, set page orientation. Bookmark the permalink.